Pure Maple Syrup is one of Natures's purest sweets produced in the spring of the year by condensing, through a process of evaporation, the sap of the sugar maple. According to Native American legend and lore, maple syrup and maple sugar was being made before recorded history. Native Americans were the first to discover 'sinzibuckwud', which is Algonquin for maple syrup, meaning literally 'drawn from wood'. The Native Americans were the first to recognize the sap as a source of energy and nutrition. They would use their tomahawks to make V-shaped incisions in the trees. Then, they would insert reeds or concave pieces of bark to run the sap into buckets made from birch bark. Due to the lack of proper equipment, the sap was slightly concentrated either by throwing hot stones in the bucket, or by leaving it overnight and disposing with the layer of ice out which had formed on top. It was drunk as a sweet drink or used in cooking. This knowledge was then passed to European settlers and has been refined over the last 200 years. 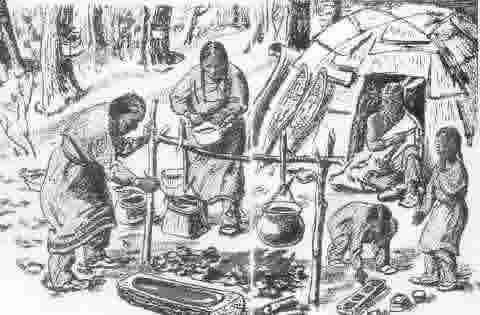 Native Americans processing maple syrup in the spring.